After leaving Quartzsite we first headed south for a few days to Yuma. Yuma is a big winter Snowbird town and there is much to do and see. Broncos beat New England and advance to the Superbowl. 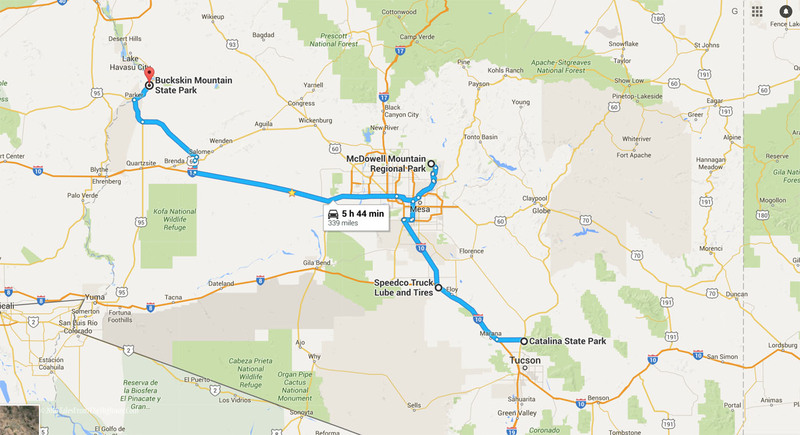 flocked eastward to Lake Roosevelt Windy Hill Campground in Tonto National Forest. Our loop here is pretty much empty except for our 4 Rigs and the camp host. $8 per day for dry camping. $4 if you have a Geezer Pass. help you extend your tank time. It is extremely quiet and peaceful here in the winter. Me Ron & Stan on the right and Jim on the left. All sites have a nice view of the lake. The El Nino` Winter has contributed to a much greener environment this year. While here we broke out some of our bacon from Oscars Smokehouse. An early morning hike each day helps to work off some of the bacon. We celebrated Maxines 29th birthday............ again. A favorite is barbecue pizza night. The crust is rolled out and put on the grill. One side is toasted golden brown. The crust is flipped and the ingredients are placed on the toasted side. The pizza is placed back inside the barbecue to toast the other side and melt the cheese. who had passed away the night before. You can see how large they are by the person holding it while it warms up. till it is just a spot in the night sky... joining the rest of the stars in eternity. The doodles are waiting for the ok to come out of the bedroom. 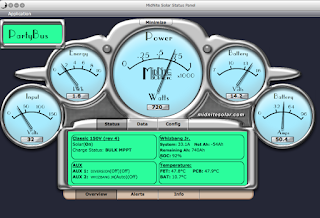 My solar installation has been working great. With my office equipment running all day I still have a full charge by the afternoon. This screen shot shows my monitoring software. Our plan is to stay here for at least another week. I've got great 4g service and a great view. colder for a few days but somehow we will endure. If it's Mid-January then this must be Quartzsite, Arizona. the RV show and related gatherings. Many RV clubs hold get togethers all over the nearby desert. Like thousands of others, we staked out our own piece of the desert. Just pull off the highway in a spot that strikes your fancy and make yourself at home. A colorful sunrise usually starts our day. We meet up with old friends from our Montana Group. About 30 Rigs formed the circle. We parked outside but nearby. A paraglider makes a low pass behind our bus. A visit to the RV Show is always on the list of activities. There is the "Big Tent", plus acres of Midways. Lots of junk vendors, plus many reputable products. Its a great place to acquire needed upgrades. A few dollars of mine were left in the tent. Inside the "Big Tent". Its about a football field in size. Gracie and Lucy get a visit from Buddy & Chili, two new pups in the group. and learn about new vendors at the show. This was the final happy hour at the Montana Circle. But many more Arizona Sunsets remain ahead. on the steering and suspension of the bus. handling as well as keep the bus tracking straight in the event of a steer tire blowout. We are also having MCS's (motion control units) installed on the airbags. enters or leaves the airbags. comfortable ride as well as add an important safety feature to the steering. to Yuma where we will stay at an RV Park thru Sunday. This is our usual post Quartzsite activity. so there will be more happy hours ahead as well as Bronco Sunday. Once again its time to play a bit of catch up. several weeks have gone by since we last touched base. and New Years at Catalina State Park. in Fountain Hills, Az - east of the Phoenix Metro. an Oil Change, Fuel Filters, and a generator service. Buckskin Mountain State Park in Parker Strip Az. Christmas Day we started with some Cinnamon Raison French Toast. Christmas presents for the doodles. They watch as Kate gets them ready. Can we have our toys.... Pleeeeeze! Their pile of new toys. at less than $5.00/lb. Needless to say - guess what I roasted for our Christmas Dinner? A good bottle of Bordeaux, a nice slab of beef, and my Favorite Girl. Enroute to McDowell Mountain we stopped at Speedco for some regular maintenance. Our home for 6 days - site 68. Normally a great view and fantastic sunrises are the order of the day here at McDowell. El Nino has some other ideas for us however and we had 5 straight days of rains and fog. Kate took this opportunity to fly to Chicago to visit our friend Mary. I held down the fort with the Doodles. for Kates arrival back in Phoenix. We then moved to Buckskin Mountain State Park. Buckskin is in a narrow canyon and is quite scenic. The availability of water creates a green oasis in the desert. The view out the front window. Across the street by the river and beach. 4 years of College and you to can be a professional pooper pickerupper. Just up river from the Campground is the Parker Dam. One of the local residents. group as well as meet some new folks. visit the Quartzsite RV show, and enjoy the whole Q atmosphere. More to come from Q for sure.